Not long ago, I was visiting an elementary school, talking to students about air quality. I often carry a jar of air with me when I do these types of outreach programs. Unbeknownst to the students, the air in that jar contained a hint of smoke – created by placing a freshly extinguished match inside the jar for a moment, and then removing it. When I took the lid off and allowed students to smell the air inside the jar, they knew at once that the air inside wasn’t clean. But several students also remarked about how good the air smelled. Apparently the scent of smoke conjured happy memories of grilling out, campfires, and roasting marshmallows. Wood smoke may smell good in the cool fall and winter air, but it’s definitely not good for you. Burning wood releases toxic chemicals like dioxin, formaldehyde and arsenic. Burning also floods the air with fine particles that can become embedded deep inside the lungs. Numerous studies link particulate exposure to serious health problems, including heart and lung disease. Wood smoke can affect everyone, but children under 18; older adults and people with diabetes, heart disease, asthma or other lung diseases are the most vulnerable. As a person with asthma, I try to avoid breathing wood smoke whenever possible. Yet, before coming to work for the Division for Air Quality, I admit that I treated my wood stove with less respect than it deserved. I broke several cardinal rules about how and what to burn in that stove, never realizing I was jeopardizing my health, creating unnecessary pollution in my neighborhood and wasting wood. For example, I never paid much attention to what kind of wood I was burning. I mean, the fire will eventually burn it, so why worry if the wood is wet? It turns out that wet wood produces a LOT more smoke than dry, seasoned wood. Inefficient combustion is the culprit, and the result is more pollution and less heat. 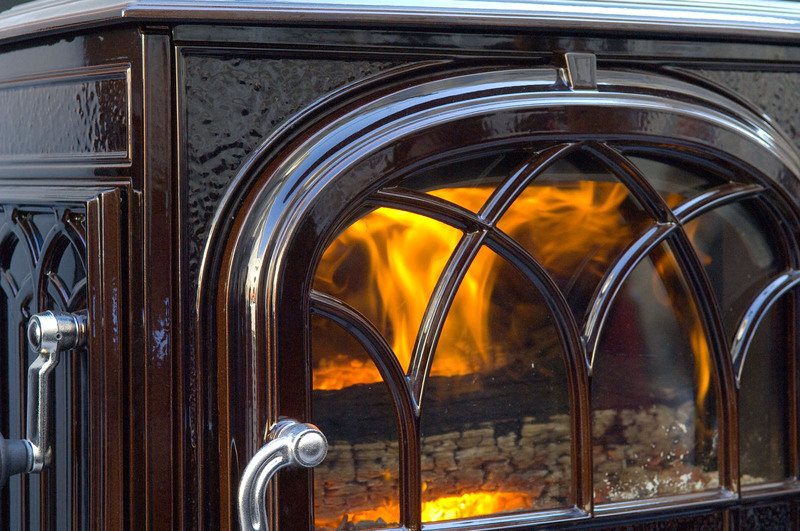 Burning wet wood can even damage your wood burning appliance or chimney by causing creosote build-up. Dry, seasoned wood is the key to a hot fire. Never burn freshly cut firewood, which can contain up to 50 percent moisture. Seasoning the wood means allowing the moisture to escape over time – at least six months before burning. Seasoned wood burns hotter, cuts fuel consumption and produces less smoke. But properly seasoned wood takes more than just time. Splitting the wood before stacking is crucial to allowing internal moisture to escape. Once split, wood should be stacked and covered to keep out rain and snow. Firewood is ready to burn if it contains less than 20 percent moisture. A handy little gadget called a moisture meter will tell you whether you’ve reached this magic number. Moisture meters are available at your local hardware store and cost between $20 and $40. To use a moisture meter, first split a piece of firewood so that the inside is exposed. Place the prongs of your moisture meter against the freshly-exposed wood. The meter should read less than 20 percent. A smoldering fire produces excessive smoke, so be sure to maintain a hot fire, even overnight. Keep the damper open and the front doors shut for maximum efficiency. Never burn household garbage including cardboard, plastics, foam, magazines and wrappers. All of these produce harmful chemicals when burned and may also damage your wood-burning appliance. Never burn coated, painted or pressure-treated wood, which releases toxic chemicals when burned. Never burn plywood, particle board or any wood with glue in or on it. They all release toxic chemicals when burned. Season all firewood. Seasoned wood burns hotter, cuts fuel consumption and reduces the amount of smoke your appliance produces. Properly seasoned wood is split, securely covered or stored, and aged for at least six months before burning. Seasoned wood is darker, has cracks in the end grain, and sounds hollow when smacked against another piece of wood. Choose the right firewood. Hardwoods are the best. Never burn trash or treated wood which can emit toxic air pollutants. Start it right. Use only clean newspaper or dry kindling to start a fire. Never use gasoline, kerosene, charcoal starter, or a propane torch. Don’t let the fire smolder. Many people think they should let a fire smolder overnight. But reducing the air supply does little for heating and increases air pollution. Clean ashes from your wood-burning appliance. Excess ashes can clog the air intake vents, reducing efficiency. Be sure to dispose of ashes in a metal container away from the house or any flammable material to reduce the risk of fire. Keep your chimney clean. A clean chimney provides good draft for your wood-burning appliance and reduces the risk of a chimney fire. Have a certified professional inspect your chimney once a year. Follow instructions. Operate your wood-burning appliance according to manufacturer’s instructions and follow all maintenance procedures. Keep the doors of your wood-burning appliance closed unless loading or stoking a live fire. Harmful chemicals, like carbon monoxide, can be released into your home. Size matters. Choose the right-sized appliance for your needs. If your wood-burning appliance is too big for your room or house, fuel will smolder and create more air pollution. The U.S. Environmental Protection Agency (EPA) estimates that some 10 million wood-burning appliances are in use across the U.S. today. And though the Division for Air Quality doesn’t regulate emissions from wood burning appliances, there are plenty of things you can do minimize air pollution from your wood stove. You’ll breathe easier, and your neighbors will thank you too! It pays to learn before you burn! The moisture content of this wood is too high. Burning this wood would produce more smoke than heat. Photo by Roberta Burnes. Well-seasoned firewood should have a moisture content below 20 percent. The moisture meter demonstrates that this firewood is dry and ready to burn. Photo By Roberta Burnes. Great article! How about a follow-up regarding the care/use/placement/legality of fire pits, especially in subdivisions?